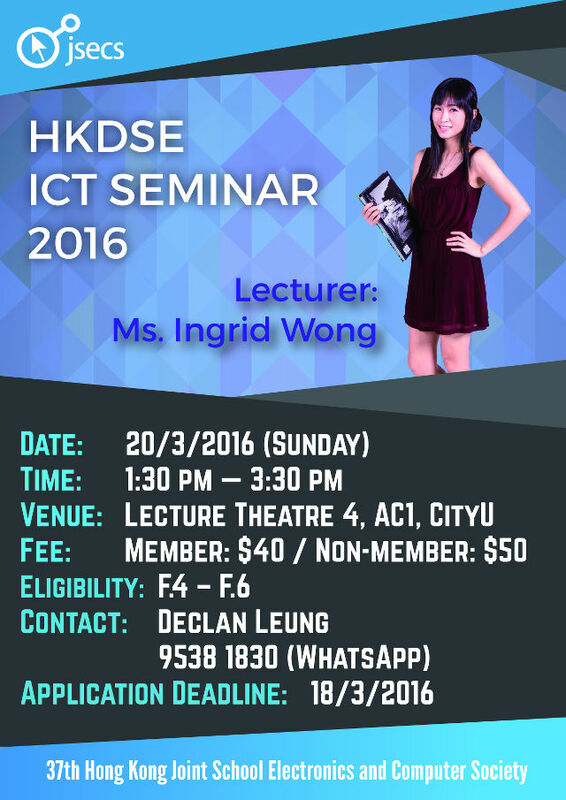 The HKDSE ICT Seminar 2016 is now open for application. Aiming to providing a comprehensive experience to our members, JSECS holds activities that enrich your IT knowledge and prepare you better for your future success. The HKDSE ICT Seminar targets HKDSE examination candidates and prepares you to tackle the ICT examination. This year, we are honored to have Ms. Ingrid Wong, (MSc in IT, BEng in CSIE), a professional ICT tutor, to be the lecturer of the seminar. The seminar consists of one core lesson. **Notes would be given on the lecture. Successful applicants would be informed via email with more details.